An impassioned debate and propaganda battle on the Union was carried out via the medium of print. Daniel Defoe, A discourse concerning the Union (1707); George Lockhart of Carnwarth, Memoirs of the Affairs of Scotland (1714). The prospect of an Anglo-Scottish union aroused intense debate and generated a wealth of pamphlets, both for and against the proposal. Although the 1707 settlement took the form of a complete 'incorporating' union between the two parliaments, many Scots preferred some sort of federal arrangement. There was even discussion of whether Scotland should unite with the Dutch Republic. Speeches by politicians in the Scottish and English parliaments were published, alongside religious sermons on the question of union. 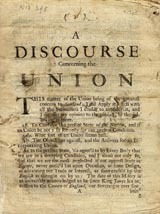 The pro-union arguments of Daniel Defoe, an English agent operating in Scotland during 1706 and 1707, were also published in an effort to sway Scottish opinion. Though the Union eventually came into force on 1 May 1707, the controversy continued. Seven years later, George Lockhart of Carnwarth, a pro-Stuart MP who had opposed the Union, published his influential Memoirs of the Affairs of Scotland. 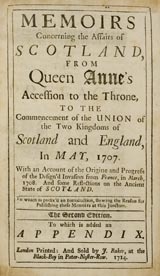 This work helped to cement the image of Scottish independence betrayed by corrupt Scots politicians, such as Queen Anne's chief minister in Scotland, James Douglas, Duke of Queensberry.